Jeff For Banks: Top 5 Total Return to Shareholders: #1 BofI Holdings Inc.
Top 5 Total Return to Shareholders: #1 BofI Holdings Inc. I was recently moderating a strategic planning discussion with a multi-billion dollar in assets financial institution. During the discussion, the President of one of the bank's most profitable divisions opined that less than $10 billion in assets was the "dead zone". They had to grow to survive. I challenged the thinking. But he held firm that the regulatory environment, changing customer preferences, and the pace and expense of technology were driving the market towards bigger is better. In that, I thought, he has a point. But I'm always looking for support. This blog has dug deep into the numbers to support the notion that bigger is better. I wrote about the best performing FIs in ROA (see link here), and how growth impacted expense and efficiency ratios (see link here). Neither supported this regional president's opinion. 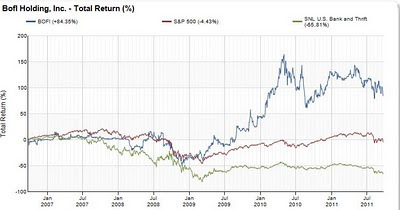 This time, I searched for the top five best performing FIs by total return to shareholders over the past five years. After all, what is the point of becoming big if you cannot deliver value to shareholders? I used two filters: the FI had to trade over 2,000 shares per day so there is some level of efficiency in the stock (this created a larger FI bias in so doing); and the FI could not have a mutual-to-stock conversion during that period, which muddies the waters. 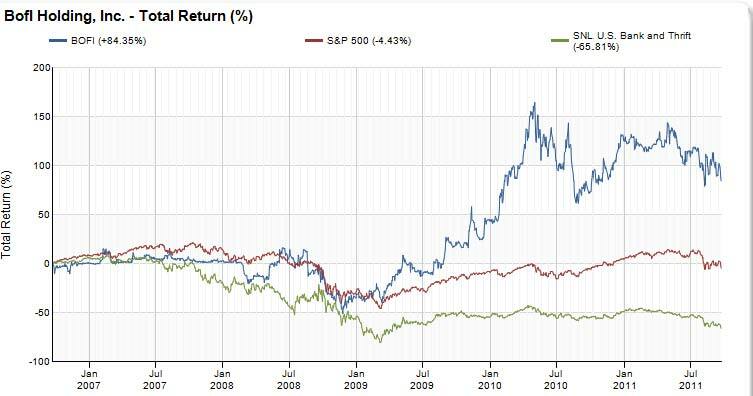 Old school bankers are rapping their fists on mahogany desks, mumbling under their breath, and turning over in their graves at the notion that the best performing FI based on five-year total return to shareholders is an Internet bank. Yet here we are. Bank of the Internet was formed in 2000 and went public in 2005. Over the past five years, it has returned over 80%, compared to -4% for the S&P and -66% for SNL Bank & Thrift Index (see chart). As Mel Allen would say, "how about that". In spite of the stellar five-year performance, the stock currently trades around book value, and a 9x earnings multiple... low by industry standards. The trading multiples are in spite of a 1.26% ROA and 14.83% ROE year-to-date. Why such low multiples for such high performance? I'm not sure, but I have to think some high-brow snobbery regarding Internet banks is involved, much like fine wine drinkers' attitudes while quaffing a Sam Adams. 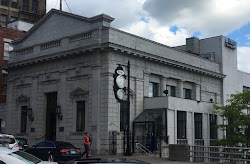 Not sure why you would have a high-brow attitude towards this bank, since its management team is made up of investment bankers, blue-chip consultants, and engineers (see here for management bios). BofI prides itself on process discipline, delivering the best technology at the lowest cost, without the millstone of branches dragging down performance. Their efficiency ratio was 40% for their fiscal year 2011 (ended June 30, 2011). They collect deposits primarily through three online brands, and are seeking affinity relationships to expand their brands. At June 30, 2011, the online bank had 32,000 accounts being served by nine CSRs (see below). 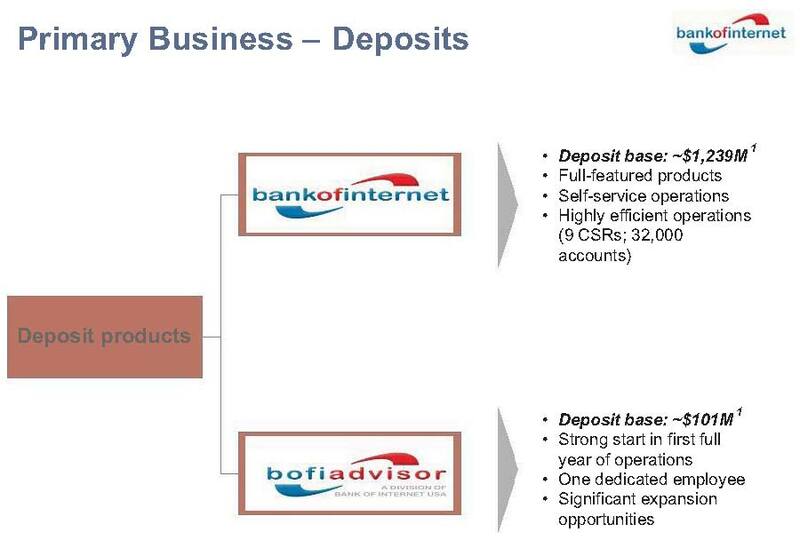 BofI has also launched BofI Advisors, giving financial planning firms the ability to offer banking to their clients through a self-branded portal. 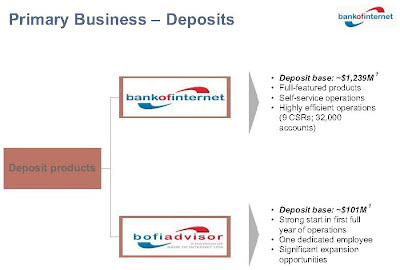 In other words, the financial advisory firms serve as the point of entry to the bank, with BofI providing the back end banking services. Vietnam, a communist country, did not develop the infrastructure for a nationwide telephone system. When cellular technology advanced to the point that telephone lines, poles, and in-home wiring wasn't required, they embraced it. The result: Vietnamese can talk to one another as easily as we can in the U.S., but don't have telephone poles delivering outdated technology. BofI is Vietnam, without the beef noodles. Bankers should take note. #4: Bank of the Ozarks, Inc. Note: I make no investment recommendations in my blog. Please do not claim to invest in any security based on what you read here. You should make your own decisions in that regard. FINRA makes people take a test to ensure they know what they are doing before recommending securities. I'm sure that strategy works out.